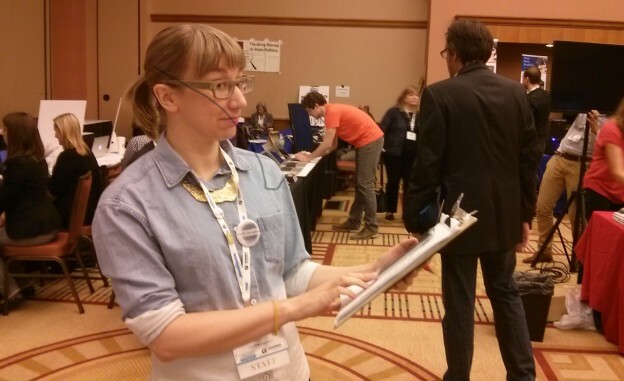 Erin Pohlgren doing a final check at ONA14 Midway. Photo by Barbara Iverson. Click the image for more coverage from ONA14. Online News Association (ONA) is the cool kids’ conference when it comes to journalism. There is plenty for educators from ONA14 Midway and all you have to do is let your fingers do the browsing. One way it builds that cachet is the access it gives to those who can’t make it in person, either to all the sessions or to the conference at all. ONA was the first of the journalism organizations to embrace a “digital first” philosophy and makes resources available online after the show has left town. It isn’t as much fun as being there, but checking out who was presenting on the Midway and reviewing what is online at ONA14 is useful for journalism educators. Beyond the sessions at ONA are the exhibitors displays on the Midway, a good source of inspiration and ideas for educators. A discount offer for purchasing “yourdomain.press” as a way to strengthen a brand caught my eye. The company says by using “.Press Domains, organizations and individuals can adopt online identities specific and relevant to their field of work leveraging the credibility that PRESS evokes.” I’m still considering my own .press decision. Another Midway attraction appealing to educators was VoteTocracy, a non-partisan policy analysis startup site. In a time when “public affairs reporting” fails to catch the interest of potential students, a tool like VoteTocracy gives me hope. For journalism educators, VoteTocracy puts students right into reporting about legislators and legislation, without having to spend weeks or months just tracking down and organizing information. As Charles Saldarini, managing partner at VoteTocracy explained, its dashboard lets a novice (or anyone) track legislators, particular bills or actions taken on bills, as well as track Congressional committees. Saldarini told me VoteTocracy invites journalism educators to contact them to discuss favorable institutional rates. They want people to use their product, and ONA educators just might want to do so. Just as Nate Silver‘s FiveThirtyEight blog made polling and politics interesting, journalism educators could deploy VoteTocracy to make public affairs reporting intriguing to students. The analysis on the site is done by former GAO employees who know policy and practice, according to Saldarini. Dan Pacheco, chair of journalism innovation at Syracuse University, presented a session showing off the virtual reality display in the Midway. Gannett is using Oculus Rift head-mounted devices for experiments in explanatory journalism. The devices — which cover the top of one’s head and face — don’t make viewers seasick these days, and the visual experience is stunning. But I think the day when we find a large audience for news via Oculus is not here yet. The Googlers brought Glass to the Midway, but I’ve had trouble getting Glass to fit and work with my regular glasses, so I left that experience to others. The updates in Google Tours, Maps, and Earth are worth exploring with your students because Google is working to make storytelling easier with their tools. Northwestern University’s Knight Lab had a space on the Midway. They have produced lots of prototypes and one-off projects. Ryan Graff showed me StoryMap from their Publisher’s Toolbox and it produces a polished, professional looking map-based story, without lots of tweaking. That one is a must if you are teaching mobile journalism or mapping skills. Away from the Midway, ONA14, true to form, included lots of concurrent sessions, so no one can see everything, even if they are on site. Journalism educators can try out the scheduling “app” developed for the conference. It is online and even without signing in, it shows session offerings, speakers and sponsors. You can track sessions by using “Teaching & Training” and other filters. Attendees were able to check in at sessions, and their avatars are shown with session information. As you read about the sessions and see what people tweeted about them, you can also make connections with people checked in at the session. It is a novel way to find sources and experts. The ONA Video Team produced 15 packages from sessions like the Lady Leaders Lightning Panel, which are available on YouTube. There are teaching ideas aplenty in those video overviews of sessions. Hard at work in ONA14 Student Newsroom. Photo courtesy of ONA14 website. Check out the exemplary ONA student newsroom. The student reporters covered sessions but also put together a guide to getting home from Chicago after the FAA incident in Aurora that grounded air traffic and stranded lots of ONA attendees. Point your students toward “HumansofONA” which is a Q&A with ONA speakers and attendees, too. According to Topsy.com, a Twitter search tool, there are 37,659 tweets with #ona14 from the last seven days. Let students search and make meaning there by matching tweets up with sessions and speakers from the event. I found Steve Ladurantaye’s visualization of the tweeting-est journalists at ONA14 there. 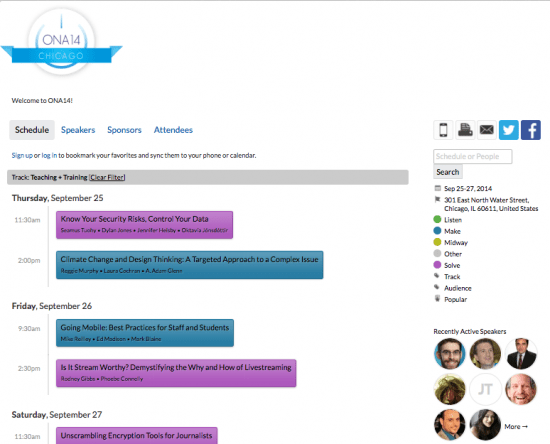 There is plenty for educators from ONA14, even if you didn’t make it to Chicago. All you have to do is let your fingers do the browsing. Barbara K. Iverson, PhD, teaches at Columbia College Chicago. Her current work focuses on mobile reporting and data journalism. She is the co-founder and publisher of Chicagotalks.org, a hyperlocal news site for Chicago. Iverson is interested in how digital technology and information transform communication and society. A “midlife” journalist, Barbara once taught elementary school, worked as an educational researcher, and was a pioneering interactive multimedia producer in the days of CD-ROMs before the World Wide Web.